Well it's only taken me about a month to post, but I'd say this party is well worth the wait. I had a blast working on twins Sawyer and Preston's first birthday party. I've been friends with their Aunt Lauren since 9th grade and have had the pleasure of making many memories with their family over the years. 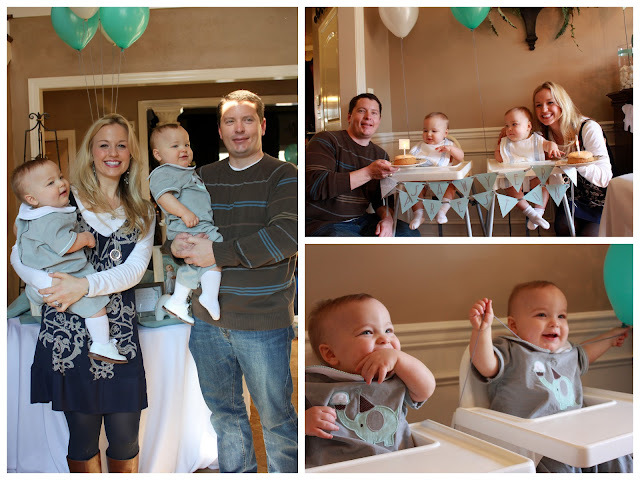 So when their mommy, Hayley, came to me asking for help with their first birthday, I was thrilled. She wanted it to be perfect and put a lot of time and thought into making it just right for them. I was so glad to be able to help her with the process, and I think the final outcome was nothing short of amazing thanks to all of the family and friends who helped along the way. 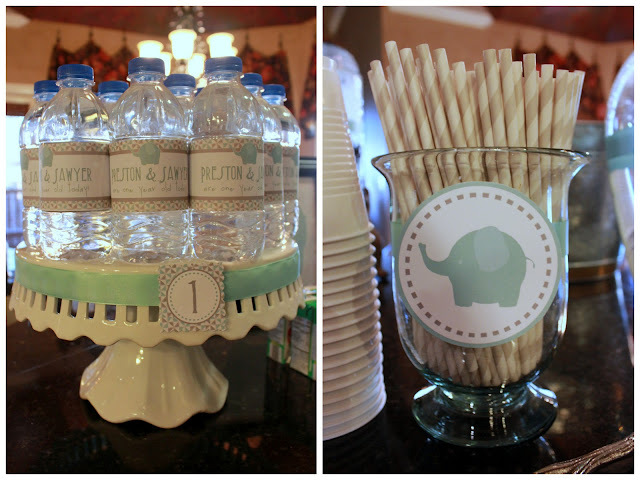 Hayley's in-laws' beautiful home proved to be the perfect setting for the soiree. 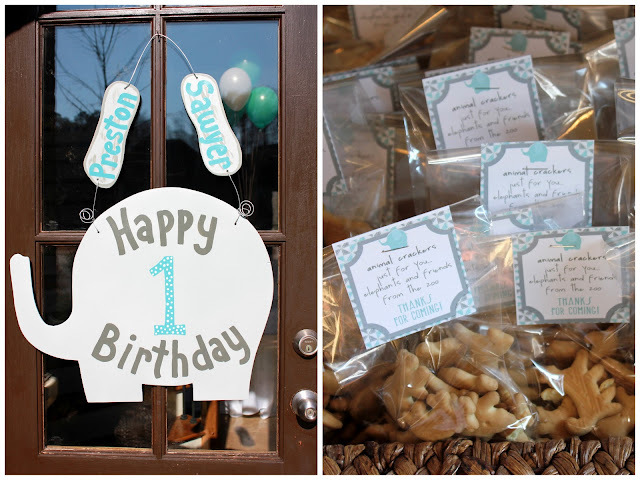 A custom door hanger was placed at the entrance and animal cracker favors reading "Animal crackers just for you. Elephants and friends from the zoo" were in a basket by the front door for easy access upon guests' departures. 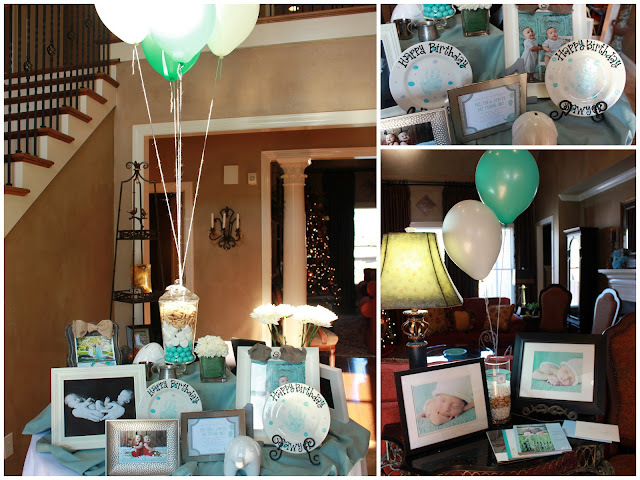 The entry table displayed photos documenting the boys' first year. 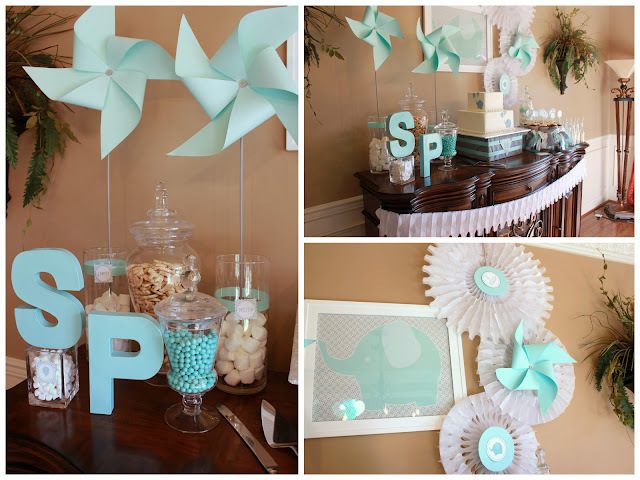 Pinwheels and paper flowers gave the party a vintage vibe. And an assortment of apothecaries were placed throughout with marshmallow, animal cracker, gumball and chocolate candy fillers inside. The boys' first year monthly pictures and paper balls hung from ribbons in the front window. 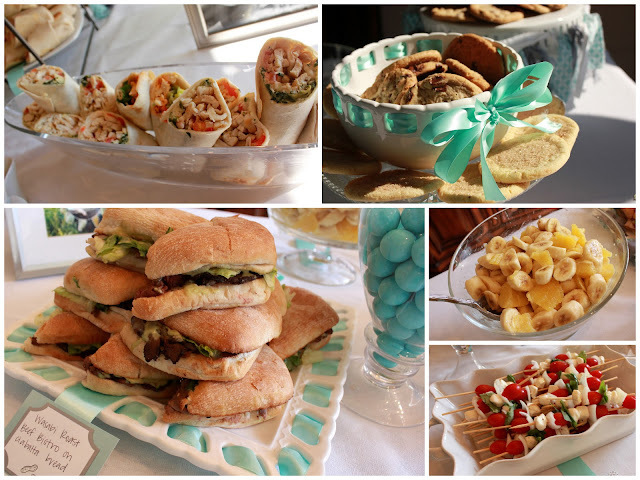 Wraps, sandwiches, veggie kabobs, chips, fruit and cookies were served for lunch. The party wasn't the only thing styling on this day. The boys wore custom outfits made by their very talented Nana. The attention to detail was amazing. 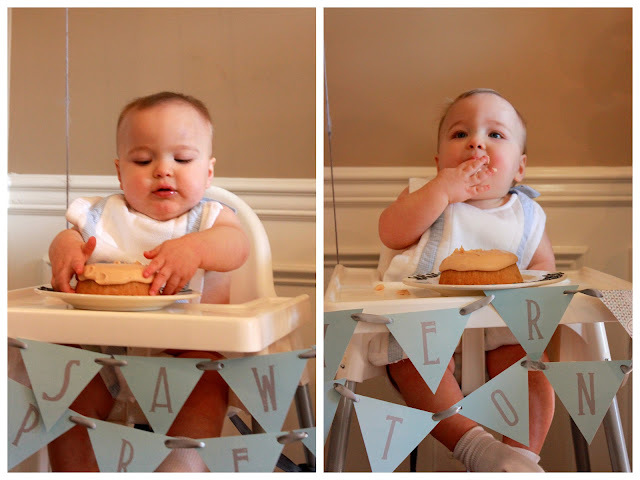 After snapping some pictures in their sweet outfits, it was time to get the cuties naked for eating their first cake. The cakes were served on personalized plates featuring the boys' painted hand prints. 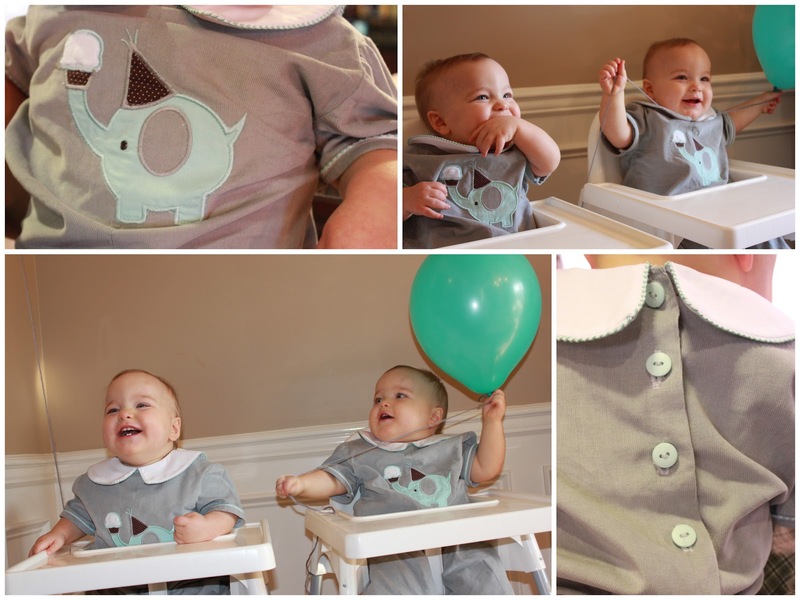 Their momma wanted to them to have a keepsake they could use at each birthday celebration to come. I loved the idea! After the boys had their fill, it was time to cut into the big party cake, made by the same bakery that did their parent's wedding cake. Cold milk was served alongside it in Starbucks frappuccino bottles. 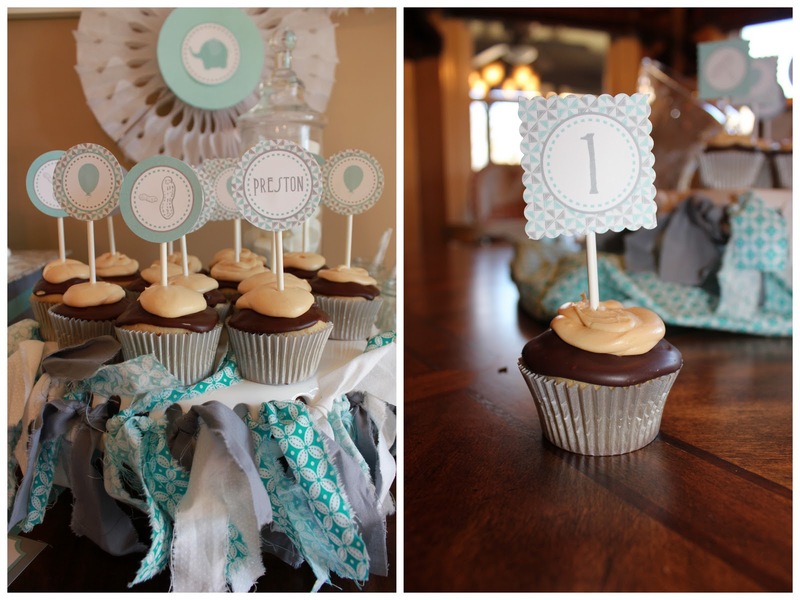 Delicious chocolate-caramel buttercream cupcakes, made by S and P's Aunt Lauren, were also served for dessert. 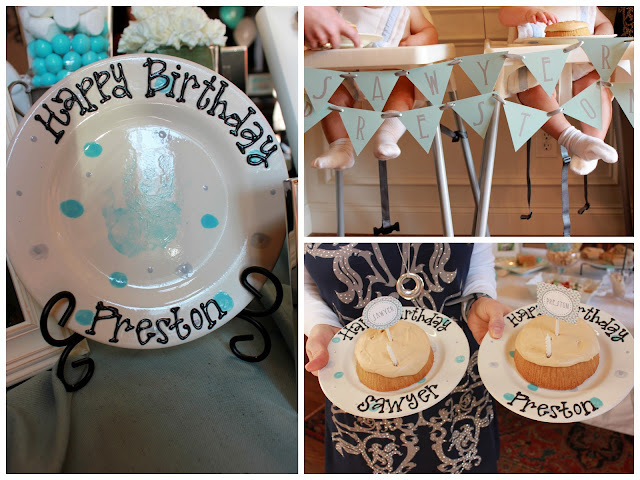 I hope you had a fabulous birthday, Sawyer and Preston! 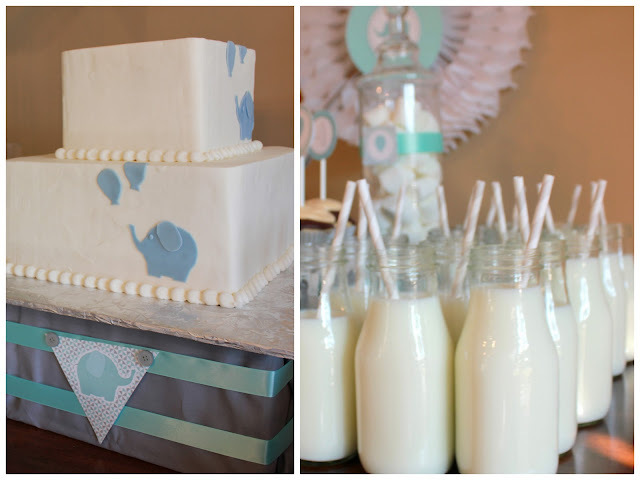 A little detail, and a lot of love was put into making your day so very special. I'm so glad I got to be a part of it!